Las Vegas Nv., March 10, 2014 – Unlike the oft-reported, camera-shy, giant, hairy hominid that creeps virtually unseen through America’s forests, this Bigfoot was seen by everyone in Las Vegas, or at least everyone in the 25-and-over American Division at the Kickoff Classic. 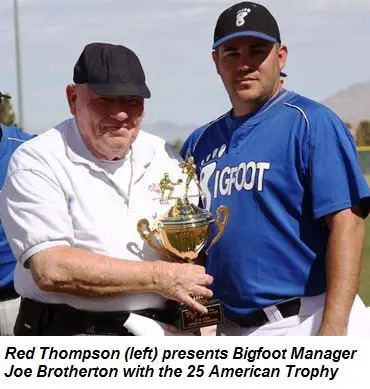 For the second time in three years, Joe Brotherton’s southern California-based Bigfoot Baseball Club claimed 25 American Kickoff gold with a 17-5 sasquatching of the Chicago Seminoles at Arroyo Grande in Henderson. Ben Bruff allowed five runs and scattered 11 hits en route to a complete-game victory. Bigfoot also won the 2012 Kickoff by beating the Las Vegas Dirtbags. Pal Gutierrez , Alex Renteria, and Ernie Cabral each contributed three hits to the 19-hit Bigfoot attack. It Lost in the post-game spectacle of celebrating Yeti was the fact that in the past 11 Kickoff tournaments Mike Cibelli’s Seminoles have finished second six times, including each of the past two years. They have reached the semifinals 10 times, and claimed one championship – 2005. For the first six innings, this championship game looked like it could go either way. Neither team scored through the first four innings. Bigfoot had a four-run rally in the fifth inning highlighted by Robert Williams’ three-run double and Gutierrez’ RBI single, but Seminole starterBrian Henschel got back on track in the sixth with a scoreless inning. Bigfoot surged ahead in the late innings, however. Tony Gatoff’s three-run triple in the seventh keyed a five-run rally. Cabral went yard for two more in the eighth, and then the dam burst during the six-run ninth. The Seminoles got a surge of optimism in the seventh inning on Barna’s three-run double. Both teams looked to be on an offensive rampage entering the finals. Bigfoot stomped top-seeded Utah in the opening round 11-2, while the Seminoles defeated the second-seeded Las Vegas Senators 20-8 to earn their place in the finals. Brotherton said this year’s tournament was the best offensive tournament his team has put together with Tim Pettitt leading the way with a gaudy .680 average. “Any guy could step in there and do the job.” Solid pitching, including complete games from Christian Martinez, Bruff, and Renteria, were also keys to the title.